Osinbajo inagurates two new ministers – Royal Times of Nigeria. Acting President, Yemi Osinbajo, on Wednesday inaugurated Stephen Ocheni (Kogi) and Suleiman Hassan (Gombe) as ministers. This comes two months after their nominations were confirmed by the Senate. 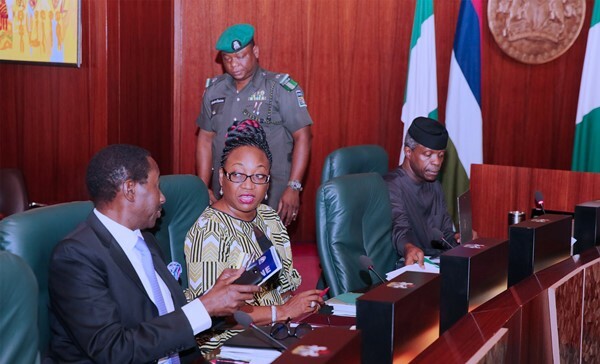 The House of Representatives had on July 11 handed down a seven-day ultimatum to Osinbajo to inaugurate the ministers. The inauguration took place inside the Council Chambers of the National Assembly. Osinbajo said, “We have focused our attention on key areas of that economic recovery plan and we believe those key areas are things that need to be done to make a difference in the Nigerian economy and in the lives of Nigerians. “Time and time again we have continued to emphasise the need for ministers to pay particular attention to all the areas that we have highlighted in the economic plan. “President Muhammadu Buhari decided to task ministers with specific functions and so we expect our new ministers to be part of this Herculean task in turning around the Nigerian economy and making life better for the citizens.